My sweeties, tomorrow, we’re off to Paris! It’ll be a special trip for me because it’s my first time in ages that I’m travelling to Paris all planned by myself and not on invitation for a blogger-event where everything is planned from start to end. No, this time I had to book and check everything on my own and that was exciting but also a hell lotta work, you can imagine! But now, we’re all set and ready to go and I hope to make enough time apart from work to also walk around and enjoy some of this beautiful city. 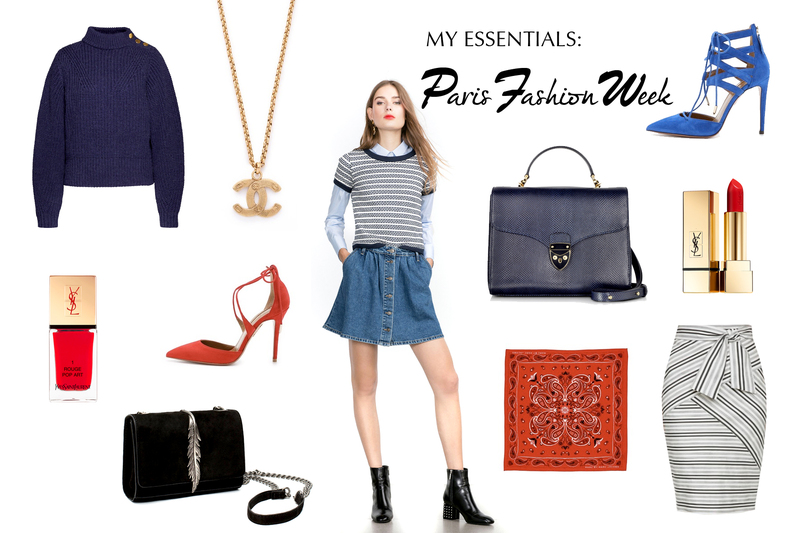 Apart from eating macarons, shooting outfits and drinking coffee, I am also planning to visit showrooms from ACNE, Esther Perbandt, VARIÉTIÉS, UMASAN, Lancaster Paris etc., and see the Kaviar Gauche fashion show at Grand Palais. If there is anything you want to specially know about one of the designers, you can tell me and I’ll see if I can find it out for you. For my trip, I also went shopping and found some lovely things (like this perfect YSL rip-off suede bag by ZARA) to wear in lovely Paris. Of course, the inspiration board I created picks up the colours of the French flag and the maritime style that I love so much. Oui oui, it may be so very cliché, but I love it nonetheless! I hope you’ll enjoy this collage as much as I do. Happy Wednesday and enjoy your last day of September! Eine super Collage hast du da gebastelt!! Mir gefällt der Pulli ganz links am besten!